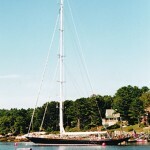 The 124′ sailing yacht ANTONISA slipped into the waters of Linekin Bay on August 28, 1999, amid accolades to her builder, Hodgdon Yachts. The Italian owners and some 4,000 well wishers, including Maine governor Angus King, crowded into the small village of East Boothbay, Maine, for the launching. 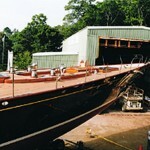 Hodgdon Yachts, headed by fifth generation boatbuilder Tim Hodgdon, 44, has been building wooden boats since 1816. In 1989, the family firm shifted from traditional plank-on-frame construction to superbly crafted yachts of high tech wood/epoxy composites. The Bruce King-designed ANTONISA is the yard’s fourth to utilize WEST SYSTEM ® products in its construction materials—including some 2,000 gallons of epoxy. The launching process began with workers removing the end of the boat shop. Brownell Inc. of Mattapoisett, Massachusetts had modified the boat’s cradle with the addition of four sets of wheel assemblies attached to hydraulic cylinders. Each assembly consisted of six special weight-bearing tires. The cylinders were used to help change the direction of the tires, raise the cradle off the ground and keep the boat level. It took over seven hours just to winch the vessel out of the shop and a total of three days to travel the few hundred yards to the boat ramp. Steel plates laid on the curved roadway kept the yacht level, then extended the ramp far enough into the water for ANTONISA to float at high tide. Even so, when festivities began, ANTONISA sat on her trailer, only her keel awash in the rising tide. A pulley was attached to an underwater ledge in the bay and a cable was run from the cradle through the pulley back to a winch on one of the trucks. After the speeches and christening by Mrs. Antonisa Natuzzi, the cradle was pulled farther into the water until the sloop’s buoyancy, with the help of air bags, lifted the vessel free of the cradle. Launching didn’t end the work. ANTONISA was tied to the barge in deep water where divers inserted the centerboard. 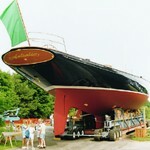 It was permanently fastened when ANTONISA was hauled a few days later at Sample’s Shipyard in Boothbay Harbor. 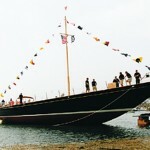 The vessel draws 9.75′ with the centerboard up, 26.5′ with the centerboard down. At the former Percy and Small Shipyard (now Maine Maritime Museum) in Bath, Maine, two cranes stepped the 174.9′ carbon fiber mast—tallest in the world of its type. Interior details, fine tuning the rigging and testing the 6,761 square feet of composite sails are continuing at Hodgdon Yachts. Delivery is scheduled for November. 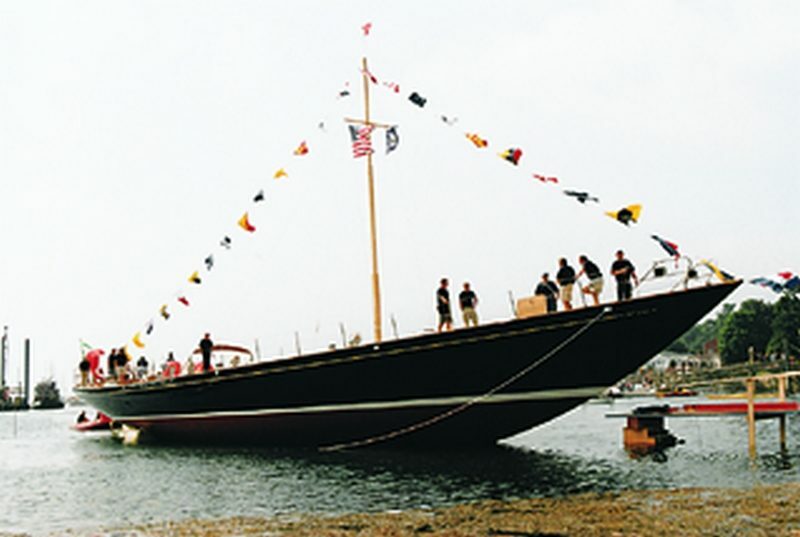 The firm will build a new larger building and renovate an abandoned marine railway on the other side of East Boothbay to accommodate its next project, a 151′ Bruce King-designed ketch, which will again will be built with WEST SYSTEM epoxy. The end of the boatshop had to come off before ANTONISA could be winched from the building. It took three trucks and three days to winch the 350-ton vessel the few hundred yards to the launch site. ANTONISA is maneuvered down the Boothbay tow ramp as far as possible at low tide so she can float off her cradle at high tide. (Mrs.) Antonisa Natuzzi is applauded y the vessel’s owner, Pasquala Natuzzi, as she swings a bottle of champagne to christen the yacht. At high tide the cradle was pulled father into the bay and the yacht floated free. ANTONISA at her temporary berth in Linekin Bay. The 174.9′ carbon fiber mast, the tallest of its type in the world, was stepped at Maine Museum in Bath. The yacht will carry 6,761 sq ft of sail. 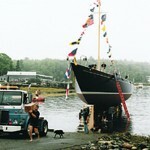 ANTONISA returned to East Boothbay for final fitting out before delivery.